The conference will discuss on issues pertaining change. 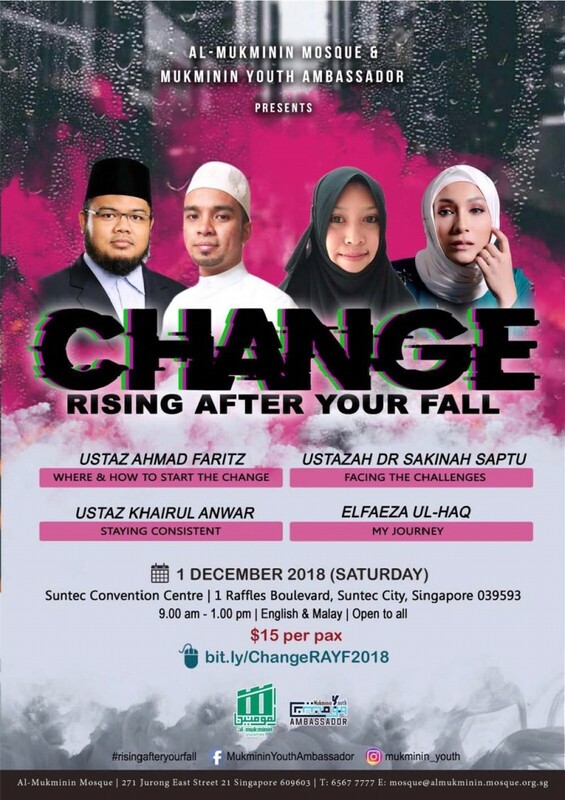 The change to be a better Muslim. The main topics are mainly; facing challenges to start change, how to begin changing oneself and how to stay consistent in the journey. The topics will be delivered by 3 invited speakers, an invited social media influencer to share about his/her experience in relation to this journey. You want to change, but you are worried that it is an impossible and daunting task. You may have tried before, but you failed. You may even question: How should I even begin my journey of self-betterment? What if I'm not able to stay consistent? Do I have the strength to overcome the challenges? . We are here for you. Together with our passionate guest speakers, this talk will help you to understand further the true meaning of the journey of change. Save the date and register now at bit.ly/ChangeRAYF2018 . 1 Raffles Blvd, Singapore 039593 ?